Slow device? Can't play high end games? RAM got eaten up fast? This is the app for you. Give your device the lighting speed in one tap! Total RAM Booster is not just another task killer. It has a newly developed innovative RAM optimization technique named "Reduced Wake Up Optimization". It scans and find the most "waking up" apps and freezes/kills* them without root/super-user permission for a better RAM Boost.Total RAM Booster gives you lot of dedicated RAM share for gaming. A must have for all devices. First RAM booster to boost when RAM is 70%, 80% or 90% used. ☆ 1 Tap RAM Booster. Game Booster. ☆ Home screen Booster Widget. ☆ Boost when RAM is 70%, 80% or 90% used. ☆ CPU usage analysis and graph. ☆ Fine, Normal, Strong and Extreme boosts. Just download and see the difference of speed in one tap. *Freezes for rooted device (need root permission. Wait for next update), kills/restart for non rooted device (current version). Android sets control over maximum RAM that can be used by all process from a single package. So TRB cannot provide more RAM share for other apps than this permissible limit. facebook https://www.facebook.com/pages/Androi... twitter-https://twitter.com/androidsavvyy Ram Booster is a great applications which frees up ram by killing unwanted applications running in the back ground. 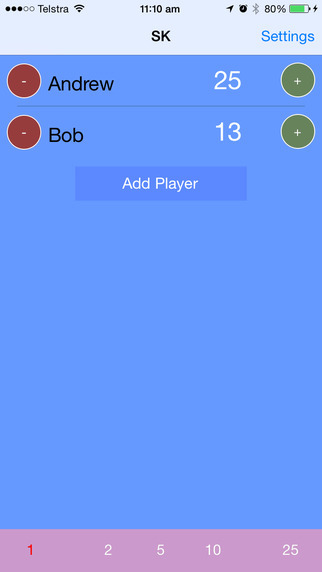 Score Tracker - Keep game scores.